It’s easier here. I know exactly what’s expected of me. As soon as the plane lands, it’s like exhaling. Whether I like it or not, I belong. I belong amongst the throngs of cowboy hats and army uniforms and riggers crowding the baggage carousel. These are the people that I understand. I belong beside my cousin in her car, laughing at her lewd jokes interlaced with anxieties, as we attempt to navigate the icy roads of the Anthony Henday and our late twenties. I belong to northern Alberta in a way that I’ll never belong to Toronto or any other place. As soon as the plane lands, it’s like I never left. I am constantly trying to reconcile where I come from with where I am. I understand my Alberta life clearly, for better or for worse. I understand it for the monotony, for the pleasure in simplicity, for the comfort and familiarity of family and old friends. (As I write this, I’m sitting in front of my aunt’s fireplace, sipping sherry beside the Christmas tree while the dishwasher drones in the background. In more ways than one, it's a perfect Sunday evening.) I understand what it means to be content, but never satisfied. I understand it as the only thing I knew for over 20 years of my life. In Toronto, I’m still grappling to figure what I mean to people and how I ended up there. I’m struggling every day to pay my rent, to nurture my relationships, to make sure that I’m taking care of myself and pushing forward—in Toronto, I'm thriving on uncertainty. And every day, I carry around a Ray Fenwick postcard in the back of my journal, tucked in neatly behind a picture my mom sent to me of me as a baby, when my hair was still naturally red and before I knew hurt of any kind. 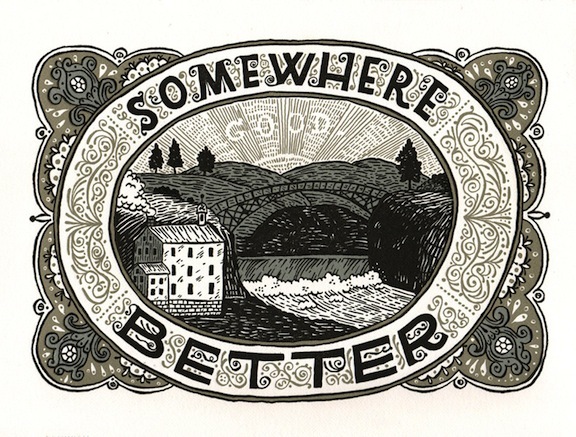 “Somewhere Better,” it says. That’s what I’m working towards. Because no matter where I am, I know I can be somewhere better.